I love warm, holiday drinks. How about you? I'm a huge fan of coffee house Christmas drinks but to save money I try and make my own at home. This one is so good and taste just like the peppermint mocha at Starbucks. Enjoy this drink and check below for more of my 30 Days of Christmas goodies. 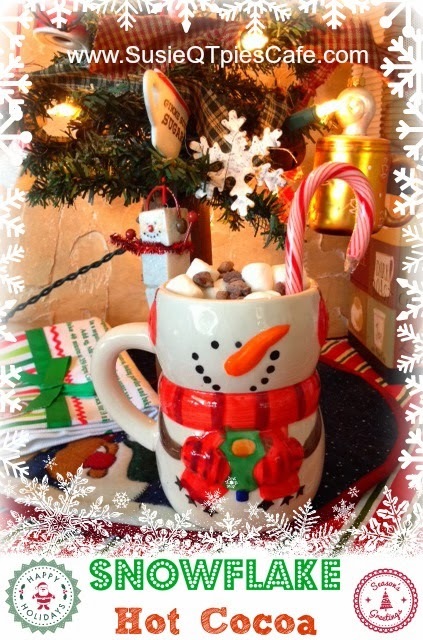 Snowflake Hot Cocoa-This is for the slow cooker which makes it idea for holiday parties! In a slow cooker, combine all ingredients except garnish. Cover and cook on low setting for 2 to 2 1/2 hours, stirring occasionally, until chocolate chips are melted. Stir before serving; garnish as desired. Makes 12 servings. My take on the recipe: I love the idea of having this in the crock pot. I have a hot cocoa and hot drink station at my open house. I serve my hot holiday drinks in Christmas mugs which I have collected over the years, people have given me as gifts or that I have picked up at garage sales. Each year people come and find a favorite mug and fill it with their favorite warm beverage. Click over here to get another warm holiday drink recipe and more info on what I have on my hot cocoa bar. Dang this sound so good. Thank you for sharing with us.